It's been two weeks since Brett went back to work, and I am happy to report that we are all still surviving! Some days are definitely better than others and pushing my assignments to nights and weekends have been leaving me exhausted, but nothing beats spending my days with my little man. Last week, we killed it. All three of us left the house totally dressed before 8am to renew mine and Brett's drivers licenses, grabbed some coffees as we walked Brett to work, got a nap in on the way home (Baby Huff) before breakfast, and made it to Cotsco by noon. I was on fire! Picture this - baby in the Ergo, blazing through Costco. I was feeding off the high from being so productive that morning and giving myself major props for getting things done with a 7 month old. Naturally I thought, "of course I can use up an entire flat of nectarines before they go bad". Who could pass up a $10 flat of organic nectarines, anyways? I threw them in the cart, next to the couple pounds of goat cheese and massive bag of popcorn that Costco somehow convinces you that you need, totally confident I was going to make all-things nectarines when I got home to round out the summer's stone fruit recipes. A couple days later, more than 75% of the nectarines are still there, ripe, and needing to be eaten like yesterday. 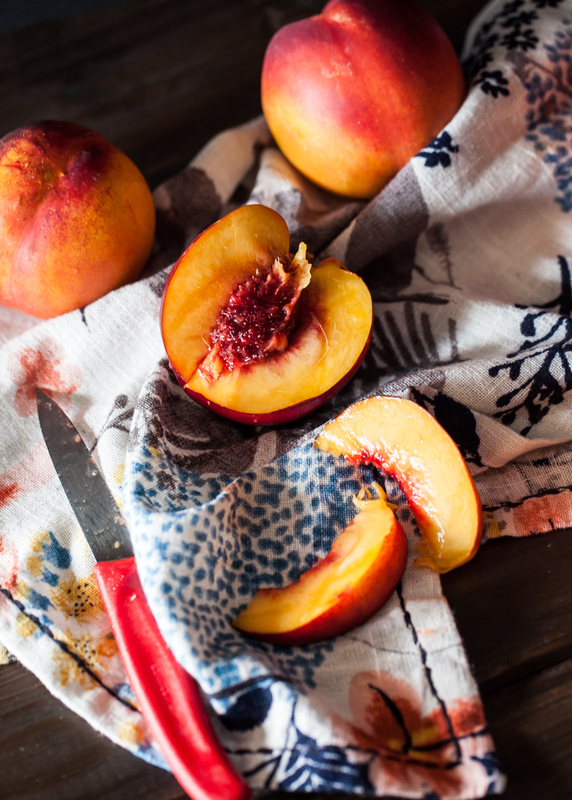 I somehow nearly finished off that entire bag of popcorn, but homemade nectarine recipes? Not so much. Like I said, some days have been better than others. 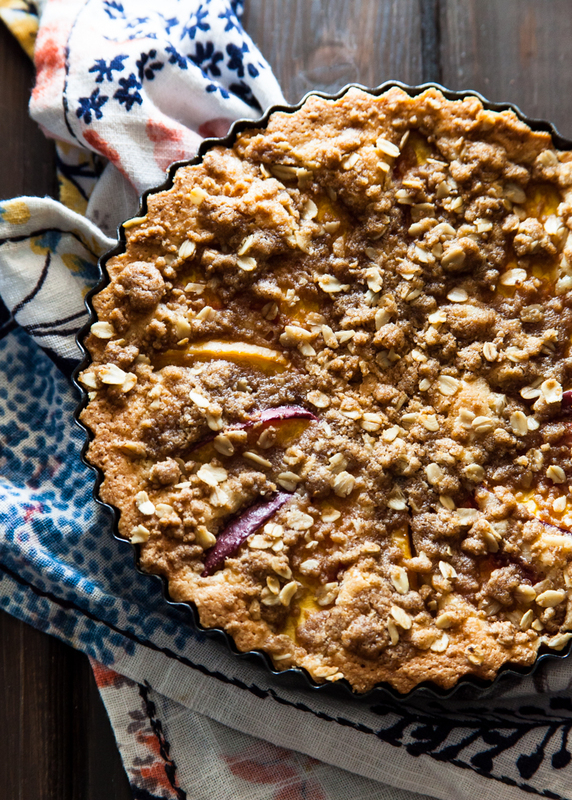 I pureed nearly all of them to freeze for Baby Boy Huff, then turned the rest into this mouth-watering Nectarine Almond Torte. This is seriously one of my favourite desserts. 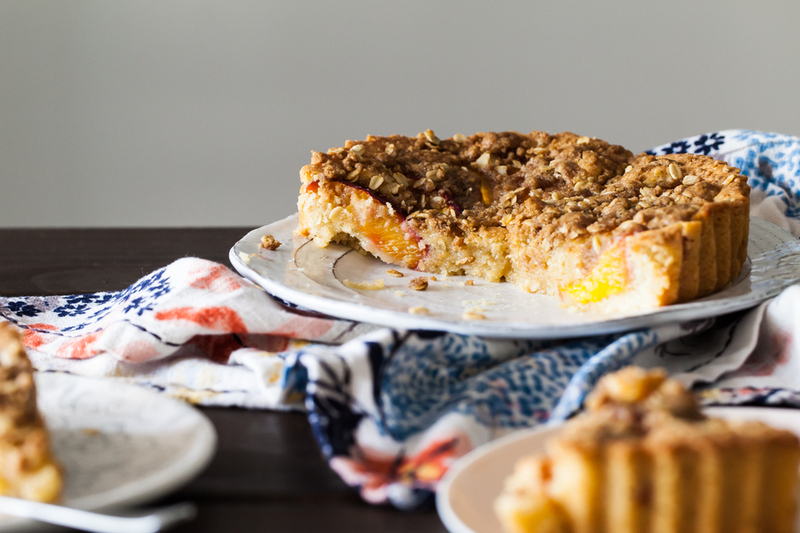 Serve it with tea, snag a slice for breakfast, or eat it straight from the oven until every last crumb is gone! It is adapted from Izy's Crustless Almond Torte in the Top with Cinnamon cookbook. 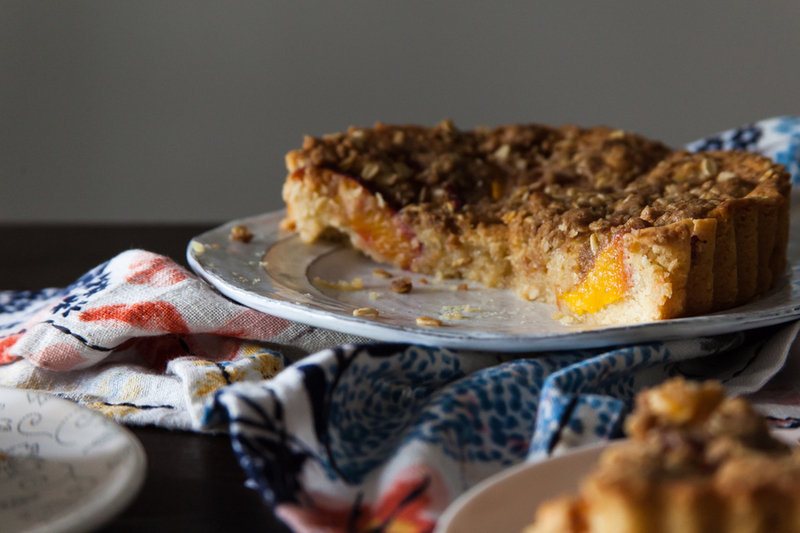 I am a sucker for anything almond, and this recipe is simply the best. Velvety, buttery, and of course - almond-y! And then I went ahead a threw on an oat crumble on top. You're welcome. Yes, it's September now and I doubt many of you still have nectarines to use, but I bet you could get away with swapping in other types of fruit. Try slices of fresh pear for an awesome fall alternative! Place all of the ingredients for the crumble topping in a mixing bowl. Use your fingertips to cut in the butter until evenly mixed. Chill in the refrigerator until ready to use. Melt the butter in a medium saucepan. Sitr in the sugar until combined and remove from the heat. Sit in the maple syrup and vanilla. Add in the egg and whisk to combine. Stir in the almond flour and oat bran until smooth. Pour the batter into your prepared tart pan. 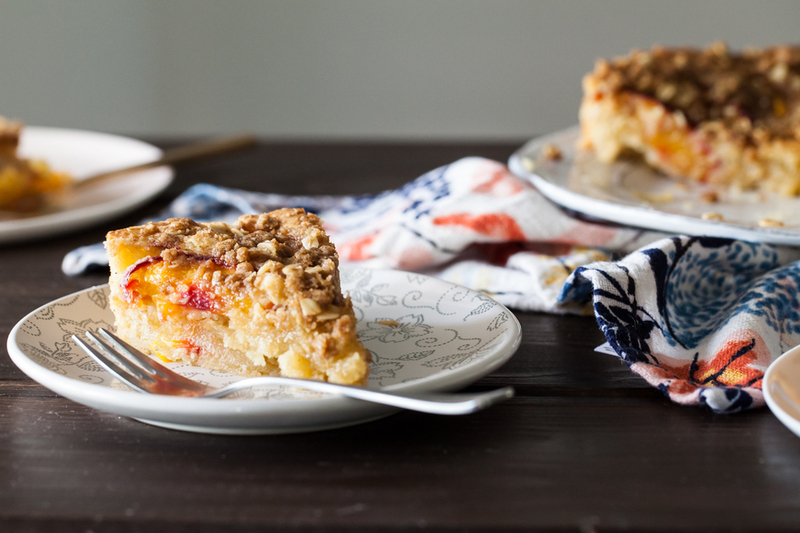 Carefully arrange the sliced fruit on top and cover with the crumble topping. Bake for about 30-35 minutes or until golden brown on top. A toothpick inserted into the centre should come out just barely moistened or with a few crumbs when done. 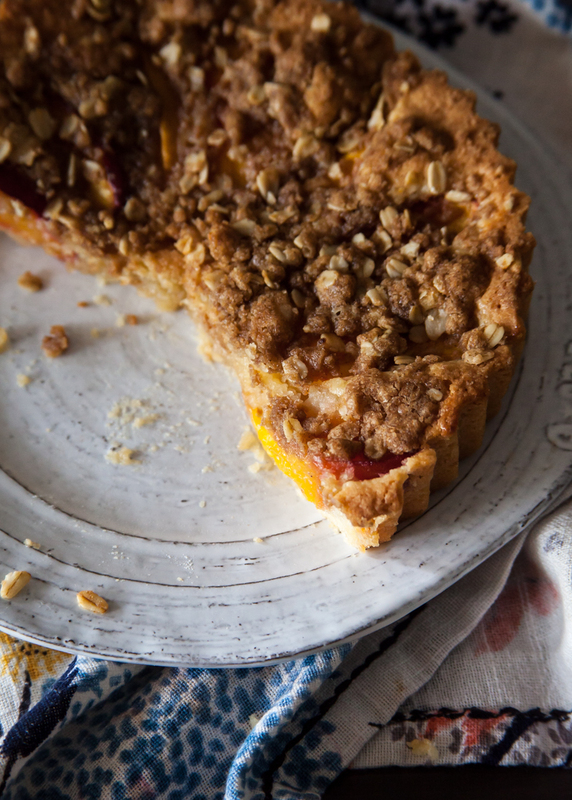 NOTES: I used an 8-inch round tart pan. It was actually almost too small and I had to leave out about a 1/3 cup of the batter for fear that it would overflow. The original recipe was made in an 8-inch square pan. I bet a 10-inch round pan would work too. Like I mentioned before, nectarines might be hard to come by the further we head into fall. While other stone fruit would totally work, I bet it would be awesome with sliced pears. Maybe even persimmons! I kept leftovers wrapped in foil at room temperature. It only lasted a couple days at my house. If you want to store it longer, then I suggested keeping it wrapped in plastic in the fridge.